In business we sometimes over complicate matters. In marketing, we sometimes overlook simple tools that can make our businesses run much smoother. Those tools are there and we take them for granted, not really taking the time to find out what those tools can really do for you. I have 3 tools that may sound obvious, but give me a minute and I will explain. There are many ways you can use emails. You can make your life more efficient, and you can use them to your advantage, but you can also use it better. My recommendation is that you use Gmail, which is Google’s email service. If you know what Google is, then you know that they are pretty good about getting rid of spam. In their email service, they are just as good at removing it. Many of you use programs like Outlook or Live, Microsoft’s version. You might say that they work just fine because they have been around forever. Yes, they are good. I have used both, but they do not do this. Now, you may be saying that you cannot use the gmail.com at the end of your emails. But I am here, you can use your regular email in your gmail account. If you want to use your regular email such as my jon@fireprotection.co.uk in gmail, all you have to do is use the Gmail for Work, which is the paid version. It’s easy to set up and all the instructions are there. Now for spam it saves you a lot of time. You can also save time in your response to emails by using things like canned responses. You can send similar messages to people. You can set timed things and send them out and honestly, it is very very easy. You can even set it for a vacation time and leave a message letting those that email you know you cannot be reached right now and that you can email them upon your return. You can also use your email for marketing. For that, you need an email service provider. Do not mix up sending out blasts through your normal email service. That is going to get you flagged as a spammer and that will be bad. Instead, you need to use something like Mailchimp or Aweber. Our preferred email service is Aweber, but we have also used Mailchimp. If you go to MarketingforOwners.com/tools, you will find links to these and all kinds of other tools. There is also a free trial or a $1 trial for Aweber to see how it works. When you send out messages, they will look after your lists and guard it against spam reports and make sure that it is done properly and formulated correctly. You have to be careful what you are doing when you send emails. Using these tools for your emails will help you to stay in the correct guidelines of the laws. Your website should have at the minimum Google Analytics. Google Analytics, which is totally free, is as good as it gets. It gives you all the metrics from your website you would ever need. It tells you which pages are popular and what is not popular. It tells you what your page load time is compared to others, and it also tells you when you have issues with Malware, etc. It’s the equivalent of having a map for when you go somewhere. If you wanted to go somewhere new and you didn’t have a map, how are you going to get there? Analytics show you how people got to you. It tells you about your business and the background story of how people came to find you. Seriously — you must have it. There are tools that will work with calendars. For myself, I use Calendly, but there are many others out there to use. These tools can book appointments and such. If you have people contacting you, why make them phone you? Simply set them up to choose times to meet or talk in your Calendly (or whatever other service you use) by sending them the link to your calendar. Have them choose what works best for them. That will integrate with whatever email calendar you have. It won’t over schedule you either. If you already have something going on, that time will be blocked out. Then it will send you a reminder once they have scheduled their meeting time with you. You can also you your calendar to block out time, that way your customers don’t choose times that you need to be working or writing. 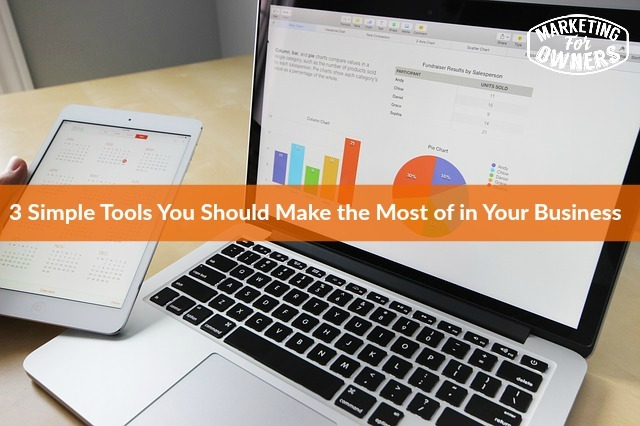 Now that you have these 3 tools, put them to use. They will make your life so much easier. Today is Tuesday and it is time for a Toolbox Tip. Now, today’s tool will help us with Conversion Testing. Now, I know that sounds complicated, but honestly — it’s not. So — let me tell you about Optimizely. There is a free version of this so you can try it out, but there is also a paid version if you want to use that instead. There are tons of Conversion Optimizing Tools. So if someone comes to your home page on your website on your homepage, there might be one headline that you see. In a basic A/B split test, in the second version, you make one with a different headline. Then the 1st person will go to one headline and someone else will go to the other. They won’t know that is happening. From that point, the software tracks their behavior and that is where the magic happens. If one performs better than the other and has better conversion rates, then you make that one the standard, and then try to beat that headline again. You might have a buy now button with a yellow color, so how about trying green? You never know. It might double your sales. Go have a look and check it out. Be sure to tune in tomorrow as my very first podcast interview will go live! I’m chatting with John Jantsch of Duct Tape Marketing. What tools could you be utilizing more?